The Grubb Preservation Foundation was created for the purpose of acquiring and holding land for conservation purposes. Two recent donations to the foundation include the Grubb Family Preserve and Lloyds Presbyterian Cemetery. The Grubb Gazebo, which once rested at the old Grubb Homestead pictured below, has been fully restored and relocated to the Grubb Cemetery in Churchland, NC. The cemetery was founded and created for its first deceased inhabitant, Henry C. Grubb, Born Aug 18, 1836 and died Dec 6, 1909. Pictured above is the old Grubb Homestead that once existed in Churchland, NC. The remains of this property, consisting of approximately 94 acre tract of land, is now held in the Grubb Preservation Foundation. This homestead was built by Henry Clay Grubb, Sr., born Nov 22 in 1870 and died Aug 9, 1913. In October 1867, a group of African American members of Sharon Presbyterian Church, in what was then known as Sharon Township (in Charlotte, NC), appeared before the Church Elders. According to minutes of that Session, these black members requested "advice and aid in building a house of worship for the colored people." 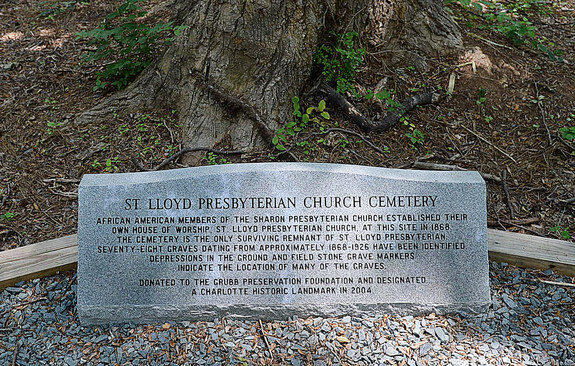 Though the names of the petitioners, or the church they wished to established, are not in the Sharon Presbyterian minutes, it is believed that these African American members were the subsequent founders of St. Lloyd Presbyterian Church. Today, what remains is the Lloyds Presybyterian Cemetery located in the heart of the South Park Mall area of Charlotte, NC. The Cemetery was contributed to the Grubb Preservation Foundation when Grubb Properties, developing a large tract of land on Sharon road, discovered the history of this specific tract of land.